A friend of mine had her heart broken by Southeast Alaska. After studying forestry, she was dispatched to the tiny town of Hoonah in the midst of the Tongass National Forest. The Tongass is huge, a 17-million-acre labyrinth of steep fjords, dripping rainforests and salmon-filled rivers. It’s one of the most rugged and beautiful places left on earth; the kind of place that can haunt the dreams of a young forester. But when my friend arrived in Hoonah, the mountains looked like they’d been nuked, and the town showed little evidence of the timber that had come from its hillsides: pre-fab houses lined the streets, the local sawmill was on its death bed, and the economy was in shambles. Logging has been declining in the Tongass for decades, but communities continue to struggle with the transition to new livelihoods—and the timber industry is having a hard time letting go. Earlier this month residents witnessed what might be its dying gasp: a directive from U.S. Agricultural Secretary Thomas Vilsack that will effectively phase out old growth logging in the Tongass within 15 years. But just before Vilsack’s announcement—the day before—the Forest Service sold 6,000 acres of old growth in Thorne Bay for logging to help ease the transition. As you’d expect, environmentalists lauded the first announcement and logging proponents the second. But the applause from both camps died quickly. On one point, at least, they agree: 15 years will never work. “Of course not,” scoffed Frank Roppel, a retired pulp mill manager from Wrangell, Alaska, who began his career setting chokers in the Tongass more than 60 years ago. Due to pressure from environmental groups and distant politicians, Roppel thinks management of the Tongass has been taken out of the hands of local communities that could benefit from it most, and this is just one more example: Anyone on the ground can see that it’ll take a lot longer than 15 years for today’s second- and third- growth stands to support what’s left of the timber industry. The way to phase out old growth logging while keeping the industry afloat would be to allow a longer grace period, Roppel says. Forest Service representatives defend both decisions, saying that 15 years is based on a number of complex factors, and that the Big Thorne sale is designed to tide over timber companies while they re-tool themselves to process smaller trees. But it takes a lot of digging to find someone who believes that “re-tooling” can revive an industry that even Sen. Lisa Murkowski (R-Alaska) admits is barely “hanging on by its fingernails.” Despite pressure from politicians like Murkowski and Gov. Sean Parnell to revive the dying timber industry to create jobs, many residents believe that the future wealth of America’s largest national forest will be measured in something other than board feet. Plus, some critics argue that logging is no longer such a boon for local economies anyway. Timber was once an important source of jobs in the region, but many of today’s loggers come in from elsewhere, do their work and leave, said Roppel. And with dozens of empty sawmills littering the Southeast Alaskan coast, most raw timber gets shipped out of the state to be processed elsewhere. Much of it goes to South Korea. For taxpayers, this may not be such bad news. Despite its abundant resources, the Tongass has never been a money-maker: the cost of doing business in Alaska combined with heavy government subsidies (to sustain jobs) means that every tree coming out of the Tongass costs taxpayers roughly $100. So what’s next? A more diversified economy, for one thing. Since mills began shutting down, fishing has emerged as a major employer. Tourism has also grown significantly in Southeast Alaska, as it has across much of the state. And small-scale sawmills that produce niche products—such as wood for musical instruments—are growing in popularity and may offer a more sustainable model of timber harvesting. 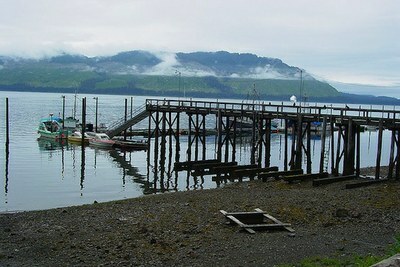 Hoonah, Alaska. Note clear cut mountains in the background. Credit: Flickr user rkeefer. As for my friend, she stayed in the Tongass for years, working for the Forest Service despite the fact that her job regularly broke her heart. She’s not supposed to talk publicly about decades of forest management that she believes has decimated ancient ecosystems while providing little lasting benefit to surrounding communities (for this reason, she asked us not to use her name), but she can’t help remembering an 18-year-old girl she met in Hoonah. The girl had grown up in a logging camp and had never been outside the borders of the Tongass, but as the mills closed and the Forest Service tried and failed to sell timber in a changing market, the girl’s family was forced to leave its home and seek out a new life outside Alaska. Krista Lee Langlois is an editorial intern at High Country News, and has spent more than 200 nights under a tarp in the Tongass rainforest. She’s described her own experiences here, here and here.